On December 1, UMe/Anthem/ole label group continues its RUSH 40th anniversary album celebrations with a lavish new expanded edition of the band's landmark album A Farewell To Kings. A Farewell to Kings, RUSH's fifth studio album, was originally released in 1977, and played a major role in establishing RUSH as an internationally popular and respected band. A Farewell To Kings also introduced the trio's first successful radio hit "Closer To The Heart", album tracks “A Farewell To Kings”, “Madrigal”, “Cinderella Man” as well as enduring fan favorites with "Xanadu” and "Cygnus X-1". The Super Deluxe Edition includes three CDs, one Blu-ray Audio disc and four high-quality 180-gram vinyl LPs. The set encompasses the Abbey Road Mastering Studios 2015 remastered edition of the album for the first time on CD; a complete RUSH concert recorded in February 1978 at London's Hammersmith Odeon, newly mixed by longtime RUSH engineer and original A Farewell To Kings producer Terry Brown from the multi-track live tapes; four newly-recorded cover versions of songs from the original album by DREAM THEATER, BIG WRECK, THE TREWS and ALAIN JOHANNES; and an instrumental studio outtake of the spacey sound effects the band has creatively titled “Cygnus X-2 Eh”. The Hammersmith show features, for the first-time ever, over 34 minutes of unreleased performances including a complete 2112 suite, “Lakeside Park”, a drum solo and “Closer To The Heart”. The Super Deluxe Edition's audio content on its CDs is duplicated on its vinyl discs. Meanwhile, the Blu-ray Audio disc contains a brand new 5.1 surround mix of the album by four-time Grammy® nominated surround sound producer Steven Wilson, along with three original 1977 promo videos from a newly found 2-inch quad video master significantly improving the video quality for “Closer To The Heart”. The Super Deluxe package also includes an elaborate new 40th anniversary cover treatment by longtime RUSH creative director Hugh Syme, who has also created a new piece of artwork for each of the album's six songs, and an extensive 12,000-word liner notes by Grammy®-winning rock historian Rob Bowman. 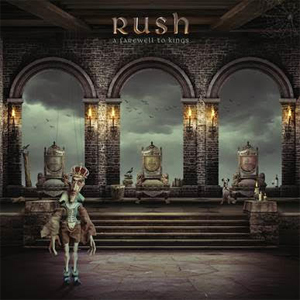 The Super Deluxe Edition of A Farewell to Kings—40th Anniversary will also include several exclusive items, including a unique King's Ring, with custom velvet pouch and neck chain; two lithographs with original artwork by Hugh Syme; a special 12-inch turntable mat featuring distinctive artwork by Hugh Syme; and a reproduction of RUSH's original 1978 A Farewell To Kings tour program. A Farewell To Kings—40th Anniversary second configuration will be released in a three-CD Deluxe Edition, with the newly reasserted A Farewell To Kings album, the Hammersmith Odeon show, the four new cover songs, “Cygnus X-2 Eh” outtake, Hugh Syme's song-specific artwork and Rob Bowman's liner notes. The third configuration will be offered as an audiophile 180-gram four-LP Deluxe Edition featuring the same audio content as the three-CD edition with double-gatefold packaging, 32-page vinyl-size booklet, the special 12-inch turntable mat, along with Syme's artwork and Bowman's liner notes. The fourth configuration, the Deluxe Digital Edition, will feature the original album as disc 1, the complete Hammersmith concert unedited as disc 2, and the four covers songs plus the outtake as disc 3. Additionally, on November 24, UMe will release a 7" vinyl single for Record Store Day's annual Black Friday event, featuring the beloved A Farewell To Kings hit "Closer To The Heart" with a custom large-hole adapter and new artwork by Hugh Syme. In his liner notes, Bowman describes A Farewell To Kings as "the beginning of Chapter Two" for RUSH. "No longer was the majority of the record dominated by the sound of a power trio. A more mature RUSH now embraced a wider sound palette using synthesizers, Taurus bass pedals, classical guitar, tubular bells, temple blocks and orchestral bells to create greater contrast and color within their compositions. Yet, when desired, RUSH continued to deploy the intensity, ferocity and power that they were justifiably known for." RUSH—bassist/keyboardist/vocalist Geddy Lee, guitarist Alex Lifeson and drummer/lyricist Neil Peart—has won a large and passionate worldwide fan base for its unique, adventurous approach, which combines sterling musicianship, complex compositions and distinctive lyrical flights drawing upon science-fiction motifs and esoteric philosophical concepts. The band has sold more 25 million albums in the U.S. alone, with worldwide sales estimated at 45 million, and has been awarded 24 Gold, 14 Platinum, and three multi-platinum albums. RUSH has received seven Grammy nominations and was inducted into the Rock and Roll Hall of Fame in 2013.